Marginal Risk of Severe Storms This Afternoon/Evening :: RickeyStokesNews.com! Scattered thunderstorms are possible this afternoon and evening across SE Alabama, SW Georgia, and portions of the Florida panhandle. A few of these storms could be strong to marginally severe, with large hail and damaging winds being the primary threats. The risk of tornadoes appears very low at this time. 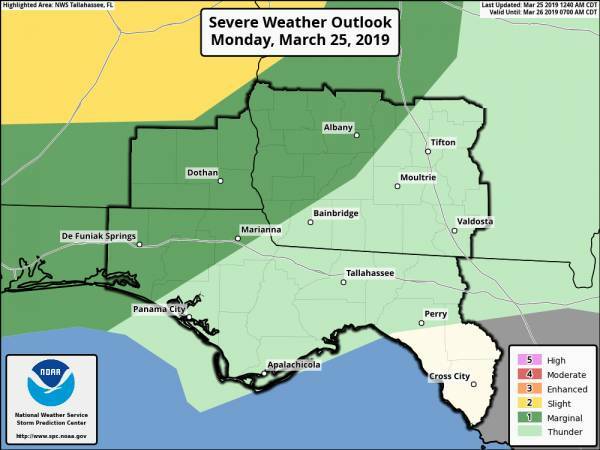 The Storm Prediction Center has placed the area in a Marginal Risk for severe storms with a greater risk just north of the area.